Accessorise your laid back look with relaxed, contemporary styling. This chic black leather plaited bracelet features a sleek stainless steel fastener and links, and is perfect for layering with other bracelets for a fashion forward vibe. 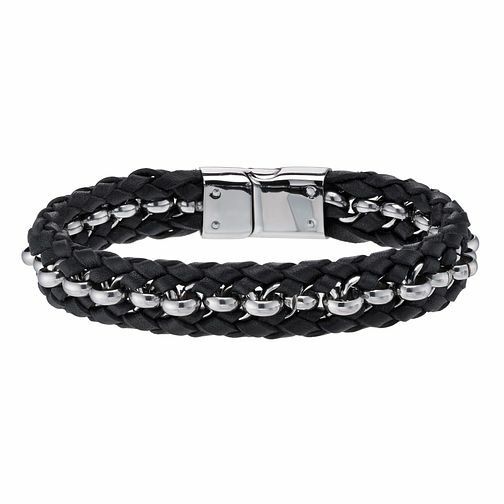 Stainless Steel & Plaited Black Leather Bracelet is rated 5.0 out of 5 by 1. Rated 5 out of 5 by Anonymous from Great and beautiful bracelet Had a bracelet for my son. He’s been absolutely made up. Quick delivery, lovely service. Thanks!